This interesting Manx surname is an Anglicized form of the Gaelic Mac Thorliot, a patronymic from a personal name of Old Norse origin, composed of the divine name "Thorr", the name of the god of thunder in Scandinavian mythology plus "ljothr" meaning "people", hence "Thor-people". The surname dates back to the early 16th Century, (see below). Church recordings include one Jane, daughter of Henry Corlett who was christened on April 27th 1606, his daughter Anne was christened on January 24th 1607, and his son Elias was christened on July 30th 1609, all at St. Gregory by St. Paul, London. One Henry Corlett married Anne Gittins on July 27th 1614 at St. Lawrence, Pountney, London, and Phoebe, daughter of Thomas and Margery Corlett was christened on January 29th 1616, at St. Dunstan's, Stepney. Variations in the idiom of the spelling include Corlet, Corlut, Coutlet, etc.. 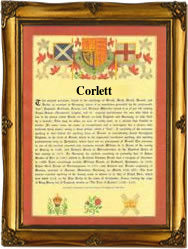 The first recorded spelling of the family name is shown to be that of Corlett, which was dated 1504, Manx Names, during the reign of King Henry V11, the Tudor (the last Welsh King) 1485 - 1509. Surnames became necessary when governments introduced personal taxation. In England this was known as Poll Tax. Throughout the centuries, surnames in every country have continued to "develop" often leading to astonishing variants of the original spelling.